Byrne Overall Security Solutions Limited was founded in 1999. From humble beginnings the company has out-grown its original office and moved to a custom designed and newly built premises in 80 Dunboyne Business Park. 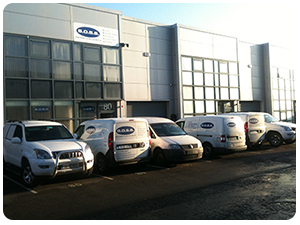 From this premises we co-ordinate all our engineers and contractors throughout the country. Since 1999 we have installed intruder alarms, CCTV systems, fire alarm systems, intercom/access control systems and tracking safety systems throughout the 32 counties, England, Scotland and Jersey for some of the country’s largest companies. Byrne Overall Security Solutions Limited are market leaders in Security solutions design/Installation and are fully licensed for installing all types of security equipment. All our staff are highly trained and licensed to carry out any installations and/or repairs to your premises. All engineers work an “out-of-hours on-call” roster to guarantee customers get through to an engineer if needed. If you would like to discuss your security needs or review your current security systems, B.O.S.S. limited would be very pleased to hear from you. Call our team in Dunboyne, the phone number is +353 1 8253800. We have updated our Privacy Statement, please view here BOSS Privacy Statement May 2018 or email privacy@bosslimited.com for more information.